The checkered gray blank spots at Google Maps says that there is no map available at that scale. It matters not what zoom level, they are there. With epiphany there is no problem. It has acted this way for some time now, and the latest updates have not helped. 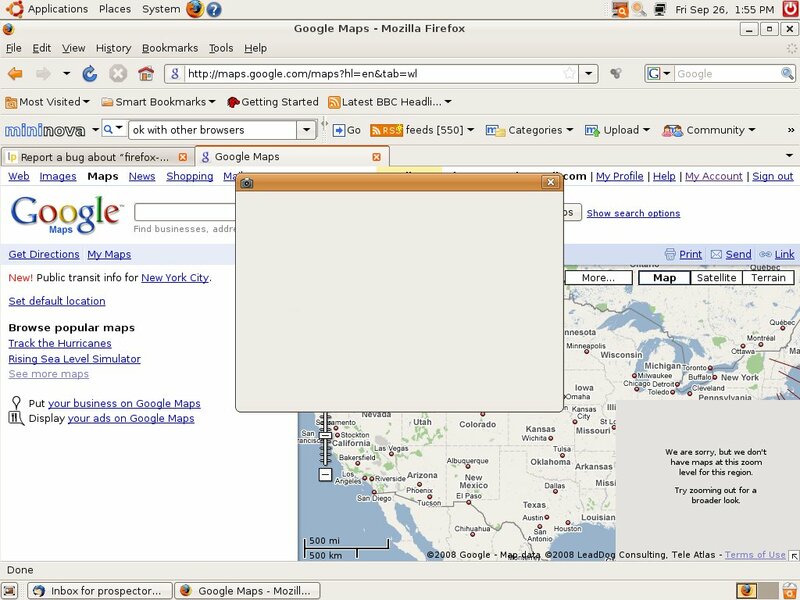 Firefox works fine with Mapquest. Also, same version of Firefox, Hardy as well, I can't reproduce this. The map looks fine to me for my area. > There's no screenshot attached. I definitely can't reproduce it at distant zoom levels. Very close zoom levels, it's sort of expected (on all browsers), but not like what you're seeing. I'm wondering if it shows that when it hasn't been able to retrieve the image before a timeout. If that were case, a combination of network latency and a low timeout could cause this, I suppose. This can be done by closing all Firefox windows (including the Downloads window), pressing Alt+F2 and typing 'firefox -safe-mode' then Enter. and it still has "roaming"
Navigation bar and the Bookmarks bar available. > Does the problem still persist if you run Firefox in 'safe mode', (i.e. > window), pressing Alt+F2 and typing 'firefox -safe-mode' then Enter. Thank you for taking the time to report this bug and helping to make Ubuntu better. You reported this bug a while ago and there hasn't been any activity in it recently. We were wondering is this still an issue for you? Could you try to reproduce the same with Ubuntu 8.10 or 9.04? Thanks in advance.